We take great pride in remaining on the cutting edge of dental technology. Our philosophy is if there is something that exists that will improve your dental experience and outcome then we will get it. Plus we love cool stuff. Our office is equipped with a 3D CBCT scanner, which is capable of taking a 3D image of your teeth. Traditional x-rays allow us to look in one plane, now we are finally visualizing your dental anatomy as it truly exists. It is hard to appreciate just what a significant leap this is. 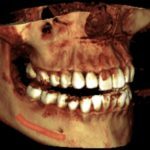 Planning on an implant? 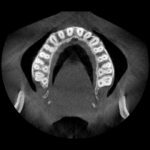 We can see exactly how much bone you’ve got, and we can combine our CBCT with our digital scanner to create a surgical guide which gives us an exact placement. Voids, defects, nerves, and hidden discrepancies that are invisible in 2D are now right before our eyes, and we can plan accordingly. No more nasty surprises. Tooth images can be spun around and sliced down as well. This means endodontic therapy becomes so much more predictable. Each tooth is a snowflake, and yours may have more or fewer canals or ones located in unexpected areas. We can slide down an image and see each and every canal, and know its position. This is like an iPhone. We were just fine before it existed, but now that we have it we can’t live without it.